By Helen Birkett in Research Postcards on 7th Nov, 2017 . This term I am based at Wesleyan University in Middletown, CT, working with the Traveler’s Lab research group. 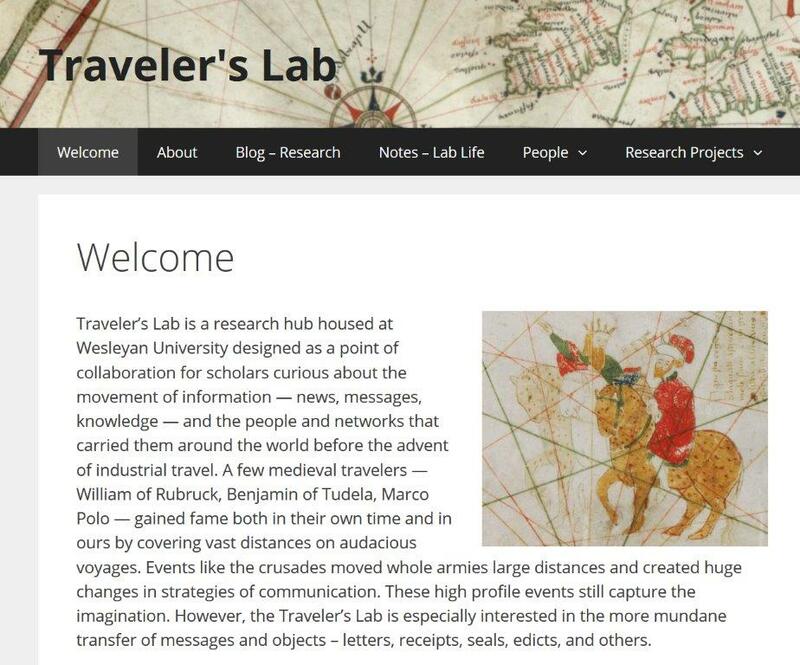 The Traveler’s Lab is a small network of scholars interested in medieval mobility and communication, and in using new digital analytical methods to explore medieval data. It is also distinctive – in the Humanities, at least! – in its use of undergraduate students as active researchers. T he Lab was founded by Gary Shaw (Wesleyan), Jesse Torgerson (Wesleyan) and Adam Franklin-Lyons (Marlboro College). I met Adam and Jesse at major medieval congresses in 2015 and 2016, and then had coffee with Gary at the British Library while he was in London on a research trip last year. The timing was fortunate: I was looking for potential members for a network on medieval news, while they were forming a group to explore the movement of information and people in the Middle Ages. We were also all interested in experimenting with new digital techniques – partly just to see what they could do! Having been vetted fully, they were happy to let me join them, even though it was unclear how this collaboration would work in practice. Not only am I usually based several time zones away, but we also make rather a diverse group: Gary, our reluctant leader, focuses on late medieval England; Jesse is a specialist in ninth-century Byzantium; Adam works on Aragon in the thirteenth and fourteenth centuries; and I’m interested in twelfth and early thirteenth-century Britain. Indeed, until this term, this collaboration had been more prospective than real. However, the granting of research leave from Exeter has allowed me to relocate to Middletown for three months and to work closely with the Lab during their Fall Semester. I’ve also been lucky enough to be affiliated with the Wesleyan’s Center for the Humanities (CFH), which has provided both office space and research resources – as well as a lively research environment. What makes the Lab so distinctive is its close co-operation with Wesleyan’s Quantitative Analysis Centre (QAC). Not only is this helping to support much of the Lab’s activity in terms of resources and student internships, but it also allows us to work closely with Pavel Oleinikov and his undergraduate students, who specialise in quantitative and digital analysis. This is a collaborative venture which allows for problem-solving and research development on both sides. Although the medievalists design and run the projects, the students and staff working with us use their own expertise to visualise and analyse the data – and this can take the project in new directions and raise important, new research questions. The fuzzy (sometimes very fuzzy…) nature of our data also poses interesting challenges for our QAC members. Being based in Wesleyan this term has allowed me to be an active member of the Lab and to understand much more fully how the ‘lab’ model operates. I’ve been allocated a small group of undergraduate students to help me with a side project on Caesarius of Heisterbach and his social network. Two of the students are helping me to create and check a new database of Caesarius’ interactions, one student is using network analysis to visualise this data, and another student is mapping aspects of this network on the landscape. Two of the students are working for university credit, while the others are paid interns supported by the QAC and the CFH. The Lab also hosts regular Lab lunches, in which we discuss new ways of analysing data and trouble-shoot problems. These lunches are important as they help to make the Lab into a research community rather than simply students working with individual staff members on separate projects. During my time here I’ve learnt a lot about the challenges of project management and the more technical aspects of working with and storing data. I now intend to use this experience to create something similar at Exeter in association with our new Digital Humanities Lab. However, transferring this approach is not going to be straightforward. It should, hopefully, be possible to set up some student internships through the College of Humanities to work on short-term projects, but it’s unlikely that other funding will be available. Likewise, the much less flexible system of credits and assessment in the UK means that it will be difficult to integrate this model into Exeter’s taught modules. Having said this, digital approaches are the way forward and will become standard parts of the medievalist’s research toolkit in the near future. This means that we need to think seriously about developing these skills and collaborative partnerships sooner rather than later. Digital techniques certainly won’t replace traditional research methods, not least because the nature of our source material means that only some of it can be converted into meaningful datasets. However, we do need to be aware of what techniques are available and how they might be used alongside tried-and-tested qualitative approaches. The sheer array of digital analysis possible was brought home to me this weekend at the Social Science History Association conference in Montreal. I was present as part of a session organised by the Lab, in which Gary, Adam and I presented work that had been produced in collaboration with our student researchers. Although ours was the only medieval panel, the questions raised concerning the organisation, visualisation and sharing of data all suggested ways that we could develop our research – both individually and as part of a bigger collaborative Lab project in the future. Particularly interesting were presentations by Ian Gregory (University of Lancaster), who has been developing new ways of analysing and visualising texts, and Anne Knowles (University of Maine), an expert in Historical GIS whose Holocaust Geographies project is pushing her away from maps and towards new, more abstract and expressive ways of presenting this data. It has to be said that the conference itself was a somewhat different experience to the standard medieval congress, not least in the longer sessions, more intense timetable, and the serious lack of coffee. However, as a way of finding out how other disciplines are operating in this new digital world – and how we, as medievalists, may be lagging behind – it was invaluable.